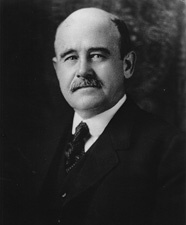 McKINLEY, William Brown, a Representative and a Senator from Illinois; born in Petersburg, Menard County, Ill., September 5, 1856; attended the common schools and the University of Illinois at Urbana; employed as a drug clerk in Springfield, Ill.; engaged in banking in Champaign, Ill., and also in the building and operation of public utilities and bridges; elected a trustee of the University of Illinois 1902-1905; philanthropist; elected as a Republican to the Fifty-ninth and to the three succeeding Congresses (March 4, 1905-March 3, 1913); was an unsuccessful candidate for reelection in 1912 to the Sixty-third Congress; chairman, Committee on Coinage, Weights and Measures (Sixtieth and Sixty-first Congresses); again elected to the Sixty-fourth, Sixty-fifth, and Sixty-sixth Congresses (March 4, 1915-March 3, 1921); was not a candidate for reelection, having become a candidate for Senator; elected as a Republican to the United States Senate in 1920 and served from March 4, 1921, until his death; unsuccessful candidate for renomination in 1926; chairman, Committee on Manufactures (Sixty-ninth Congress); died in Martinsville, Morgan County, Ind., on December 7, 1926; interment in Mount Hope Cemetery, Champaign, Ill. Dictionary of American Biography; U.S. Congress. Memorial Addresses. 69th Cong., 2nd sess., 1926. Washington, D.C.: Government Printing Office, 1927.